There are lots of things to worry about at Disneyland, but your bag doesn’t have to be one of them! 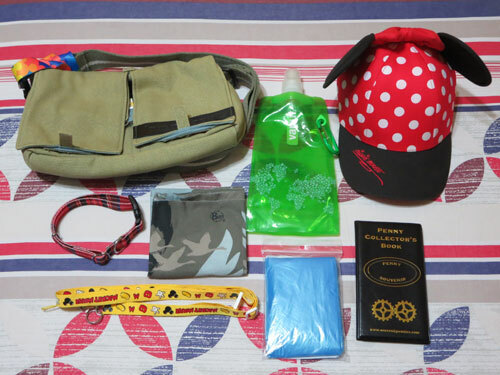 Packing a perfect Disneyland bag can save you a ton of money and spare you a headache along the way! I assembled this bag with a single guiding principle: less is more. That means less size, less weight, less jangly bits that can get lost, and less to occupy my hands with. Let’s go left to right! 1. My hardware: I use the top half of a Lomography sidekick messenger bag. It’s a sturdy canvas bag with an even sturdier wide strap. The big advantage is that the top part detaches into a smaller second bag. There are a good number of pockets and pouches all built into the bag, which let me quick and easy access to my tickets, precious Fast Passes, and candy. It’s not 100% water resistant, but it’s a little water repellant and dries quickly. Since it’s small, it’s easy to protect even on splashy wet rides and it makes security checks a breeze. That colorful thing wrapped around the strap is a lanyard with a water bottle attachment. It snaps around the neck of plastic soda bottles. I usually carry an extra lanyard anyway, cos they’re light and useful. 2. Water bottle: I use a fancy foldable water bag, because plastic bottles just take up space. Disneyland has water coolers throughout the park so take advantage of them to stay hydrated! This bottle folds up easily, and if it’s really hot, I can blow it up and use it as a fan. I usually attach this to my bag so it’s within easy reach. 4. Pet collar: An oddity, but probably the most versatile item in the bag. It’s less than $10 and designed to be strong enough for pets. Use it to carry things because painful plastic bag handles aren’t fun. Identify your bag with a colorful one. And, most importantly, secure your bag to a table or chair if you have to look away. It might not stop a determined thief, but it’ll slow them down. 5. Buff headwear: They call themselves “multifunctional headwear“ and it’s hard to dispute. A Buff is a tube of slightly stretchy, special fabric that is crazy useful. It’s very soft, absorbs a lot of moisture, and dries really quickly. I wrap it around my wrist and use it to wipe sweat off my brow; or, if it’s really hot, I wear it as a headband to protect against the sun. They’re expensive, but I carry them whenever I travel and I love them. 6. Camera lanyard: No camera attached here because I was using it to take the photo, but I like to carry my compact camera around my neck so I don’t need to fumble around for it when Mickey suddenly appears! 7. Poncho: These are basically tailored plastic bags, but offer more protection against wind than umbrellas. Buy these before you go, because theme park raincoats are expensive! They may be strudier and heavier, but they have that overpowering plasticky vinyl smell. 8. Pressed penny book: My mini book! I put my pressed pennies (which I adore) in this small book, then move them to a larger storage book at the end of the day. Because Hong Kong Disneyland uses Octopus cards (their transport card) for pressed pennies, I don’t need to lug around a pouch full of coins, yay! 9. Sometimes-extras: I call these the sometimes-extras because I don’t always need them, because it depends on the weather. These might be lip balm if the air is very dry or snacks if I skipped breakfast. In America, I carried sunblock but in Asia I don’t, because I’m more used to Asian weather – and I’m lucky that I don’t burn easily. You could feasibly do all of this with a backpack, but I find that they’re a hassle to wrangle, and I end up carrying more stuff. That extra weight translates into a raging backache at the end of the day. The most important thing to remember is that, at the end of the day, you’re there to have fun! A good bag goes a long way to help the experience so you can concentrate on having a magical time. Do you have anything in a Disneyland bag that you simply can’t go without? Share them in the comments!